In a generation of games growing stale by the minute,near the end of its life cycle, Bioshock: Infinite teaches an old industry new tricks. You start out on a rowboat, and right away I thought something here was special. The visuals were beautiful the characters odd and genuine. Your name is Booker Dewitt. You are tasked with: "Bring Us the Girl Wipe Away the Debt" and you have a picture of a girl: Elizabeth. You sit down in a chair and end up in Columbia. A world in the sky, where the 1912 American ideal was turned into a religion. Where presidents are worshiped as demigods. Where racism is rampant. People who fought for equality between races are shunned as devils. And where people like John Wilkes Booth are praised..Run by “The Prophet” Comstock. And from the moment you land in Columbia, you are entranced in its beauty. You can't not take your time as you walk around looking at the sights and sounds. You can tell how much time was put into the detailing. Kids playing hopscotch in the street. A group of singers on a flying ship. Propaganda posters. You get lost because you are admiring the scenery and there is SO MUCH going on..
Its been said before but, do yourself a favor and TAKE YOUR TIME playing this game. There is so much going on. Take it all in. But cue Elizabeth, a sheltered girl who dreams of dancing, singing, and going to Paris. This is the point where the game goes from good to great. Elizabeth is so beautifully done. Liz is seen with a thimble over her pinky and when asked about it she has no recollection of how it happened.. You grow with her. You learn what has happened to the world with her. And no matter what you love the character. She's innocent and strong at the same . An aged genius girl who's been so sheltered the sound of music or the sight of dancing makes her ecstatic. She is so well acted. I may have to go ahead and say she is the best female character in a game I have ever played. Bioshock's visuals sound design and script are so well done I could consider it a masterpiece. If you ever wanted an example of Video Games as an art; this is it. From the detail of a single woman sitting in the street singing gospel during the “apocalypse”. To the fact there is dialogue between Dewitt and Liz if Booker attempts to go in to the men's room. Or where picking up a guitar cues a scene where Liz sings a song to a scared homeless boy. You see Liz's nature when performing a melee execution in front of her; where she screams out her feelings with an “Oh My God!” or a scared screech. You walk into an arcade and begin looking around and: Elizabeth leans up against the wall and gets comfortable waiting for you. But one of the main draws of Infinite: The Sky rails. From early in the game you obtain the Skyhook. It allows you to jump on to Columbia's roller-coasteresque rails. Where you speed along shooting or just jumping from rail to rail. Or jumping off performing and instant kill attack on anyone who unfortunately happens to be near you. Its a REALLY fun addition to help lift the conventional FPS elements to something more. More often than not the fights drag on, but with the skyhook and Vigors it is always fun. Vigors are powers you obtain throughout the game. Such as throwing fireballs or possessing humans to become your allies. The combinations of using them is endless. Powers that allow you to pull far away enemies to you; and then can land them on a trap, or push them off a cliff, or just blow them away with your shotgun. The major enemies in Bioshock are scary at first and always stay relevant and difficult through out. Whether its giant robots wielding chain guns, while wearing Wax George Washington heads. Or A man made of crows who can apparate from one spot to another. They all stay difficult. Bioshock takes the conventions of normal video games and turns them on their head. It gives you the illusion of choice although none of it matters. Heads or Tails? Bird or Cage? Kill or Spare? Hit the servants or the Raffle master? In the end it all ends the same way. Bioshock is full of multiverses. Which I don't want to ruin it so I won't go into much detail. But the ending of the game is something everyone should experience IT BLEW ME AWAY. 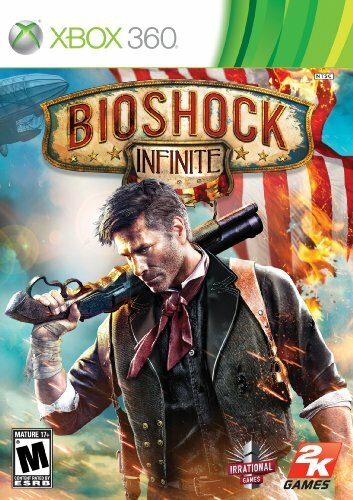 In conclusion Bioshock Infinite has probably changed the way games will have to be made. The detail spoils you, and you want more. The story is one of the best pieces I have ever had the pleasure of reading/watching/playing in my entire life. I already went into enough detail, but it is amazing. It is thought provoking. Surprising. Fulfilling. And even after seeing it all it provokes more discussion. This is replayable in a different fashion. After learning of how it ends. It changes the game when you replay. The ONLY complaint I had was; I would sometimes get stuck on corners I should have been able to push by. Only to be completely stuck. It was nothing gamebreaking. Everyone who enjoys shooters or amazing stories should either play or watch this be played. It is a feat and should be seen by everyone.